Galaga was a 1987 Atari 7800 release of the vertical arcade shooter genre game developed by Namco Limited in Japan, where it was better known as ‘Galaga: Demons of Death’. In this game the player was scored based on alien ships destroyed, and a Hit Ratio, which calculated number of hits against number of shots fired. 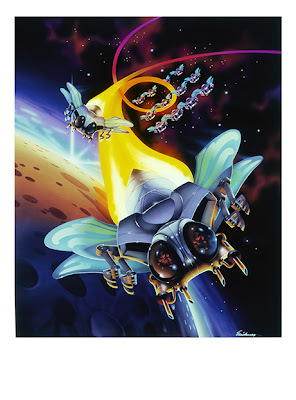 The art, airbrushed on cold press illustration board by Marc Ericksen, was commissioned by Atari for use in packaging and poster use.